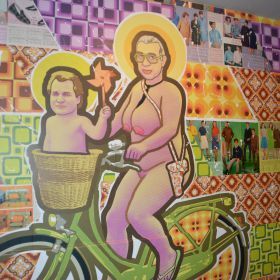 JBC's world is a symbolic overlapping of the baroque, Latin American art, soviet realism, the cult of icons, and paganism in all of its forms. His chosen themes resonate with his graphic style that evokes stained-glass windows, aggrandising people, even in the most absurd or trivial situations. His choices of warm colours and organic elements evoke the importance of the tropics to the artist's imagination and are sourced from his numerous travels in South America. Since 2013 he has been working with a number of different supports: walls, urban furniture, canvas, objects of all kinds and installations.